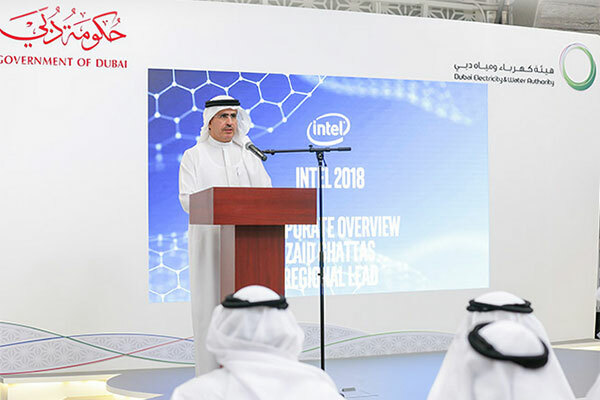 The workshop at the Innovation Tent at Dewa’s head office was conducted by experts from Intel, reviewed the latest developments and uses of AI and ways to use these technologies across Dewa’s sectors, as well as employing them to serve people and society by providing a better quality of life. “We have adopted innovation as part of our vision, based on our belief that it is a priority for the development of our services and initiatives, as well as the foundation for the development of our strategies,” said Saeed Mohammed Al Tayer, MD & CEO of Dewa. “We have adopted innovation as a cornerstone for continuous improvement to enhance Dewa’s competitiveness in all its operations. We are keeping pace with the Fourth Industrial Revolution, and taking advantage of its technologies. Dewa has been a pioneer in supporting the Dubai 10x initiative, launched by His Highness Sheikh Mohammed bin Rashid Al Maktoum, to achieve Dubai’s vision to become the city of the future, putting it 10 years ahead of other global cities,” he added. “Dubai will do this by adopting new mechanisms of work, to develop the future, and contribute to Dubai’s sustainable competitiveness through disruptive technologies such as AI, Unmanned Aerial Vehicles, energy storage, blockchain, the Internet of Things, and many others. We have launched Digital Dewa, the digital arm of Dewa that reimagines the concept of service organisations and creates a new digital future for Dubai. “Digital Dewa will enable us to apply a pioneering model for service organisations based on innovation in renewable energy, storing energy, AI and digital services. Dewa aims to shift the status quo of service organisations and transform into the first digital organisation in the world, with self-control systems for storing renewable energy and expanding the use of AI and digital services,” added Al Tayer. “This initiative focuses on four pillars, which includes the expansion of AI solutions to make Dubai the first city to provide AI-based electricity and water services. Dewa will launch a futuristic digital platform, a data hub named MORO, to improve the UAE’s digital capabilities to develop smart cities, provide state-of-the-art innovative solutions, and a successful model for Dubai and the world to benefit from our innovative approach.